« New Experiences on the Disney Wonder this fall! 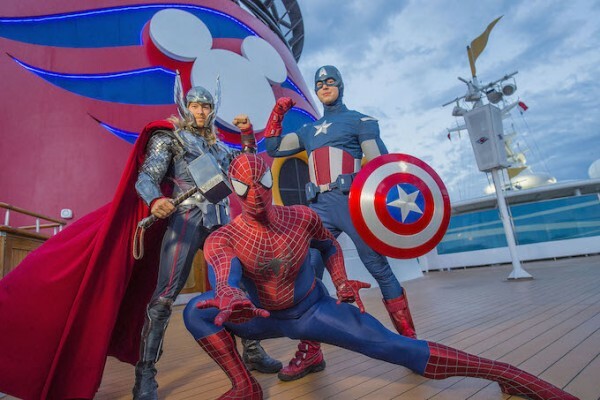 Disney Cruise Marvel Day at Sea in 2017! Occurring on one action-packed day during each of the seven Disney Magic sailings, the Disney Cruise Marvel Day at Sea will transport you to a new realm of possibilities when the Marvel Universe assembles on the ship. The event features all-day entertainment including exclusive interactions with some of the mightiest Marvel Super Heroes and the menacing foes that oppose them, an extraordinary deck party, Marvel-themed youth activities, special merchandise and unique food and beverage offerings. Disney Cruise Marvel Day at Sea will be on seven- and eight-night Disney Magic Bahamian cruises departing from New York on October 6, 14, 28; November 4, 11 and 18, 2017. All will include a stop at Castaway Cay and Port Canaveral, with a day at Walt Disney World® Resort. Disney Cruise Marvel Day at Sea will be on one seven-night Canadian Coast cruise departing from New York on Oct. 21, 2017, with stops at Charlottetown, Sydney and Halifax. Are you ready to summon your inner Super Hero for the adventures that lie ahead during this unforgettable Disney Cruise Marvel Day at Sea? This entry was posted on October 21, 2016 at 11:06 am and is filed under Disney Cruise, Disney News. You can follow any responses to this entry through the RSS 2.0 feed. You can leave a response or trackback from your own site.